The public is invited to help launch the holiday fundraiser. 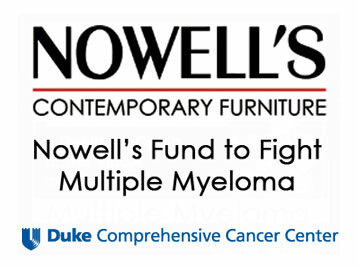 November 26, 2010 (CARY, NC) — Nowell’s Contemporary Furniture in Cary will launch its holiday fundraiser to benefit multiple myeloma research at Duke University Medical Center with an in-store kick-off on Tuesday, December 7, from 6-8 p.m. The event will include giveaways, music, refreshments, and a brief presentation on the illness as well as Nowell’s fundraising effort, “Nowell’s Fund To Fight Multiple Myeloma.” The public is invited. Nowell’s owner Jerry Nowell was diagnosed with multiple myeloma, a cancer of the white blood cells, earlier this year and is currently undergoing treatment. (1) An online auction of fine furnishings from Nowell’s that has been featured on the set of NBC 17’s “My Carolina Today” show. (2) The in-store Ekornes benefit: Every customer who purchases an Ekornes Stressless Recliner during the holiday season and donates $50 to Nowell’s Fund To Fight Multiple Myeloma will receive a $200 discount off his or her purchase. The Ekornes fundraiser began Thanksgiving weekend. Party “giveaways” will be provided by Ekornes. Multiple Myeloma is diagnosed in approximately 20,000 new patients every year in the US, and the illness claims the lives of nearly half that number annually. While there is currently no cure for multiple myeloma, on-going research raises great hope that emerging therapies may make this a manageable disease and, ultimately, lead to a cure. All contributions to the Nowell’s Fund To Fight Multiple Myeloma will benefit multiple myeloma research at the Duke Medical Center. For more information on the fundraiser, visit http://nowellsfurniture.com/multiplemyeloma.aspx. Nowell’s Contemporary Furniture is located 900 East Chatham Street, Cary, NC 27511. For more information and directions, go to www.nowellsfurniture.com. Nowell’s Contemporary Furniture is located at 900 E. Chatham St., Cary, NC 27511. Operated by Jerry Nowell, the store is in its third generation of local ownership with a commitment to contemporary and modern furniture supported by a talented in-store design team and professional delivery crew. “Defining Style Since 1905.” For more information: www.nowellsfurniture.com. February 23, 2010 (NEW BERN, NC) – RHA Howell, Inc. is pleased to announce that Raleigh Metro Magazine, the city-regional monthly magazine with coverage from the Triangle region to the coast of North Carolina, has become the first Platinum Sponsor for Blue Tie Casino Night, a major fundraising event to be held in New Bern, NC, on April 17th. Proceeds from the fundraiser will benefit children and adults with disabilities. The Platinum Sponsorship level is worth $5000. The magazine’s in-kind donation is a full-page, color advertisement for the event in its March edition. Metro’s editor and publisher Bernie Reeves is well-known for supporting a variety of charitable efforts through the magazine and its website, including Heroes of Hope, an organization that raises public awareness and funds for brain tumor research. The event will take place in the main ballroom of the Hilton River Front Hotel in New Bern and include music, fine food, signature drinks and a host of non-cash-prize casino-style games, such as Poker, Blackjack, and Roulette. The night will also feature a silent and live auction. The live auction will give party-goers a chance to bid on five major entertainment packages ranging from a Fighter Pilot for a Day experience to a Girlfriends Shopping Getaway in New York City. For more information on Raleigh Metro Magazine, go to www.metronc.com. RHA Howell is a not-for-profit 501 (c) (3) organization that has been helping people with disabilities and special needs, and their families, make choices to live more independently for more than 35 years. Integrity, high standards for quality, hard work are at the core of every RHA Howell disability assistance program. Proven leaders in caring for people, RHA Howell, Inc. is a pioneering force in the field of human services, particularly supporting infants and children. For more information, visit us at www.rhahowell.org. or join us on our Face book page. November 13, 2009 (RALEIGH, NC) – A grassroots effort in support of Pretty In Pink Foundation, a non-profit organization that provides financial resources for under-insured and uninsured North Carolinians with breast cancer, continues to grow among Triangle area retailers. Among the many retailers supporting the foundation is Generations Salon & Day Spa in Raleigh. The salon/spa will hold a “Gold Buying Party” on November 13th with a percentage of the proceeds going to Pretty In Pink Foundation. For the Party, gold buyer Michelle Pilos will set up shop in Generations Salon & Day Spa in to purchase broken or unwanted gold and silver items from the public. She will then donate 20 percent of the proceeds to Pretty In Pink Foundation. Pretty In Pink Foundation board member Renee Jankowsky, owner of Generations Salon & Day Spa, is also donating 20 percent of the price of many of its services that day, from ear-piercings and massages to hair conditioning and sales of its Caribbean products. The salon will also give away tee shirts, samples, coupons, and $10 “Generations Bucks” for use on services and products. Refreshments will be served. “When area retailers rally to support a cause, the impact is immediate. The efforts of those who champion for Pretty In Pink Foundation’s mission know that we are helping our neighbors, our friends and our loved ones conquer breast cancer. Hat’s off to Michelle Pilos and Renee Jankowsky for being community heroes.” Commented Olalah Njenga, Pretty In Pink Foundation’s marketing strategist and CEO of YellowWood Group. Njenga also notes that unlike other breast cancer organizations that raise funds for research, Pretty In Pink Foundation’s sole mission is to help with the costs related to care and surgery once a breast cancer diagnosis has been confirmed and there are financial hardships present. The gold-buying portion of the day will be held from 10 a.m. until 12 noon, and from 4-6 p.m. No appointment is necessary. Generations Salon & Day Spa is located in Brierdale Shopping Center at 10370 Moncreiffe Road, Suite 101, Raleigh. For more information visit www.gensalon.com. For more information on Pretty In Pink Foundation, visit www.prettyinpinkfoundation.org. November 2, 2009 (RALEIGH, NC) — A Cut-a-Thon to raise money for Habitat for Humanity of Wake County will be held Thursday, November 12, from 10 a.m. until 8 p.m. at Lather Hair Salon off Glenwood Avenue North/Highway 70, Raleigh. The money Lather raises will be used to help sponsor Habitat/Wake’s 2009 Holiday Home Tour & Party later in November. Complimentary beverages will be served during the Habitat/Wake Cut-a-Thon, and a donation box will be on hand so customers can donate even more if they want. “The box will also be there for anyone who may not need a hair cut that day but still wants to donate,” Williams added. Since 1985, Habitat for Humanity of Wake County has joined with individuals and local organizations to build simple, decent, affordable homes in partnership with families living at modest income levels. Habitat for Humanity helps people build and buy their own homes by creating opportunity, not dependency. Lather will accept walk-ins and appointments for the Habitat Cut-a-Thon. To make an appointment, call 919-792-0715. For more information on Lather Hair Salon, visit www.latherhairsalonnc.com. For more information on Habitat for Humanity of Wake County, visit www.habitatwake.org. Lather Hair Salon is a full-service, upscale salon specializing in color, cuts, waxing, deep conditioning treatments, shine glossing, perms, anti-curl treatments, and both trendy and classic styling. Lather also offers special wedding party services both in-salon or on location.. Lather’s stylists maintain “Hair Academy 101,” an on-going blog on hair care, styling, products, and DIY techniques. Lather Hair Salon is located at 8521 Cantilever Way, Suite 109, just off North Glenwood Avenue/Highway 70 West near Carmax. For more information visit www.latherhairsalonnc.com or call 919-792-0715. Lather Hair Salon is also available on Facebook and through Citysearch. The 9th Holiday Home Tour & Holiday Party will be held Sunday, November 22, from 5-9 p.m., beginning at the Habitat ReStore, 2420 Raleigh Boulevard, Raleigh, NC 27604. Buses will depart at 5 p.m. for an hour tour of local Habitat homes. The party will include appetizers, seafood from 42nd Street Oyster Bar, and dessert, plus live music by “Old Avenue.” Tickets are $50 each and can be reserved at https://habitatholidaycards.kimbia.com/hometour. September 18, 2009 (RALEIGH, NC) — Pretty In Pink Foundation and the Women Business Owners Network (WBON) will host “Honoring You,” a Fashion Show and Luncheon, on Wednesday, October 7th, to celebrate National Breast Cancer Awareness Month and to raise funds for the Pretty In Pink Foundation. The show and luncheon will begin at 11:30 a.m., at the Matthews House, 317 W. Chatham Street, Cary. The Fashion Show will include 10 winter styles from Doncaster in Chapel Hill, modeled by WBON members and Pretty In Pink Foundation volunteers. Fashion authority Mary Michele Little of OneChicMama.com will emcee the show. One in 10 women is diagnosed with breast cancer each year and almost 20 percent of women in North Carolina are without health insurance. Life-saving breast cancer treatment bills can total in the $100,000s. Pretty in Pink Foundation, headquartered in Raleigh, provides access to quality of life support, education and life-saving resources to North Carolinians diagnosed with breast cancer, regardless of their ability to pay. The cost for the luncheon is $20 for members and $30 for non-members who pre-register before Monday, October 5th at 12 noon. Registration at the door is welcomed for $40. For more information on the “Honoring You” Fashion Show and Luncheon and to make reservations, visit www.wbon-cary.org or contact Ruth Drum at Crossroads Business Center at 919-424-3801. Pretty in Pink Foundation is the only not-for-profit organization in North Carolina that provides financial resources for uninsured and underinsured breast cancer patients with limited financial means. Founded in 2004 by breast surgeon Dr. Lisa Tolnitch, Pretty In Pink’s vision is to have a presence in every state by 2020 and is well on the way of breaking ground in Virginia and South Carolina in 2010. More than ninety percent of donations go directly to providing the funding for necessary treatment, surgery, support and resources to help breast cancer patients win the fight. Proudly supported by Triangle-based Capital Bank, Pretty In Pink Foundation is able to minimize operational costs by maintaining a committed group of volunteers and supporters to further its efforts. For more information on donating, sponsoring, volunteering or applying for hardship funding, please visit www.prettyinpinkfoundation.org. June 10, 2009 (PINE LEVEL, NC) – The real winner of The Epicurious Vino Challenge, a charitable fundraising food and wine event held May 30th at Hinnant Family Vineyards in Pine Level, NC, was RHA Howell: The non-profit organization that serves children and adults with disabilities across the state of North Carolina was the recipient of the fundraiser. And from ticket sales, specialty raffles, and a fine jewelry auction, the event raised over $18,500. Of course, the reason the nearly sold-out crowd turned out for the event was The Challenge: 12 professional chefs from Raleigh to Kinston competed to see who could create the best signature dish using a specific Hinnant Family Vineyards wine as the key ingredient. The chefs pulled the name of an award-winning wine from a hat and created their recipes. Everyone in attendance sampled the results, including the U.S. Food Services’ team of professional chefs, who selected the Chef’s Choice Award. US Food Services’ team proclaimed Chef Jeremy Sabo of Porter’s City Tavern in downtown Raleigh the winner of the Chef’s Choice Award. Chef Sabo created a Flourless Chocolate Cake with Tar heel Soaked Cherries using Hinnant’s sweetest red wine, the “Tar heel Red.” Porter’s is one of the Urban Food Group’s collection of fine dining establishments in Raleigh. The “Peoples Choice Award,” selected by a vote from the attending crowd, went to Chef Frank Peters of Catering Works in Raleigh. Chef Peters used Hinnant’s “Southern Red” wine to create Tournedos of Pork, Hinnant Vineyard’s Southern Red Muscadine Glaze, Strawberry Consommé, Spiced Crispy Bacon, and Asher Blue Cheese, all with ingredients from local sources. Chef Manny Froehlich of the Goldsboro Country Club received an Honorable Mention for his use of Pomegranate wine to make a Duck Ballotine. Chef Joyce R. Jenkins of The Serving Spoon, a catering company in Pine Level, also received an Honorable Mention for using “Pack House Gold” wine to create her Pack House Gold Tandoori Chicken. RHA Howell has been helping people with disabilities and special needs, and their families, make choices to live more independently for more than 35 years. Integrity, high standards for quality, and hard work are at the core of every RHA Howell disability assistance program. For more information visit www.rhahowell.org.